New Moon is a great magazine for girls and parents. heyugly.org Hey Ugly is a cool website for teens and includes celebrity quotes about self-esteem and body image. thebodypositive.org The "Who we are" link has lots of good info., including how to start a body-image support peer group at your school. mhans.org Real life, real answers for teens and youth from the Mental Health Association of the North Shore. girlsinc.org The "Just for Girls" link has surveys and quizzes and puzzles and fun stuff. Anorexia Nervosa & Associated Disorders Provides info on anorexia nervosa and bulimia. Overeaters Anonymous also has information on compulsive overeating. All the Lyrics is where you can find the lyrics to your favorite tunes. Freedom from Smoking Community Check out this link if you, or anyone you know, wants to stop smoking cigarettes. 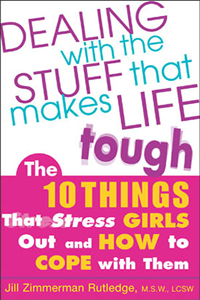 Links taken from "Picture Perfect'', ©Jill Zimmerman Rutledge, M.S.W., LCSW, HCI Publishing, August 2007, and "Dealing With The Stuff That Makes Life Tough: The 10 Things That Stress Girls Out and How To Cope With Them'', ©Jill Zimmerman Rutledge, M.S.W., LCSW, Contemporary Books/McGraw-Hill, 2004. 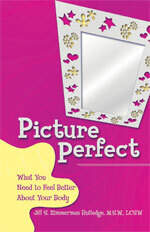 Take the Body Image Quiz! Scoring: For questions 1, 2, 4 & 5, give yourself 1 point for a, 2 points for b, 3 points for c, and 4 points for d. For question 3, give yourself 2 points for a, and 1 point for b. If you have a total score of 5-9, you're on the road to a good body image. Keep it up! If you scored 10-15, you may have some body image issues to work out. If you scored more than 16, you may have a poor body image.